After collecting Sabatini for over ten years, I finally realized that only by making up a comprehensive check list of books written by Sabatini would it be possible to track the important editions of his books. In the process of putting together the list which can be found on the Sabatini egroup web site, I have began to understand which items are the extremely rare ones. The following list is my list, not necessarily in order of rarity, of those Sabatini items which a dedicated collector will have difficulty finding. Hopefully, other collectors will have some additional items to add. The Lovers of Yvonne.This is Sabatini's first full-length published novel. It was published in 1902 by Pearson. At the time of publication Pearson was publishing a fiction magazine in England. Sabatini was a regular contributor to this magazine (see list of Sabatini magazine work compiled by Jesse Knight). This is an extremely rare item, which was only published in England. That same year (1902) G.P. Putnam published the same novel in the US but called it The Suitors of Yvonne. The US edition is also rare but not as rare as The Lovers of Yvonne. Suitors actually appeared on ebay a couple of months ago. Apparently Sabatini did not like this book and would not agree to reprint it. Perhaps this is one reason for its scarcity. Neither of the editions referred to above was issued with a dust jacket so the rarity is with the book not the jacket. Love at Arms. Hutchinson first published this book in England in 1907. A first Hutchinson edition is very rare particularly with a dust jacket. One would expect the British edition to be hard to find in the US. The first, and only, US edition was published by Houghton Mifflin in 1924 but actually printed in England. The first by Houghton Mifflin is hard to find in the US and almost impossible to find in a dust jacket. Anyone owning a first Houghton Mifflin in jacket has an extremely rare item. Surprising for a book published in 1924. I would have to guess that Sabatini did not like this book and never encouraged it being reprinted. 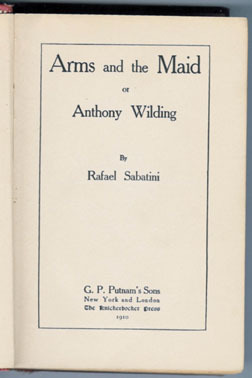 Love at Arms was not included in the Writings of Sabatini published by Houghton Mifflin in 1924. Scaramouche. Scaramouche was published in 1921 in England by Hutchinson and in the US that same year by Houghton Mifflin. For American collectors Scaramouche in a dust jacket published by Houghton Mifflin is very hard to find. This is true even though Scaramouche was Sabatini's first big seller and has been reprinted in countless editions. Captain Blood, which was published one year later and is undoubtedly Sabatini's single most popular book, is easier to find in a first Houghton Mifflin edition with a jacket. Ebay also had a Captain Blood with a jacket earlier this year (2002). Why a first Houghton Mifflin Captain Blood is easier to find than Scaramouche is one of the mysteries of book collecting. The rarity of Scaramouche is definitely with the jacket. Historical Nights Entertainment. This title was published in three series in both the US and England. The first, second and third series published in England by various publishers is rare with a dust jacket. What is surprising is that the US editions are also very difficult to find with a dust jacket. J P Lippincott published the first US edition of Series one and two in 1917 and 1919. These books are rare without a jacket and extremely rare with a jacket. The first Houghton Mifflin edition of Series one and two was published in 1924. It is very difficult to find a copy of either of the Houghton Mifflin firsts with a jacket. Again, the jacket is the rarity. Justice of the Duke.This title has never been published in the US under the name of the Justice of the Duke. 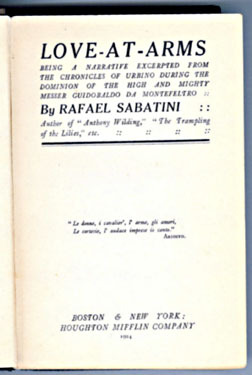 The short stories contained in the book were included in The Banner of the Bull contained in the Definitive Edition of the Writings of Rafael Sabatini. Stanley Paul published the Justice of the Duke in 1912. The first Stanley Paul edition in dust jacket is rare both in England and the US. Arms and the Maid. This is the title of the first US edition of what was later called Mistress Wilding when published by Houghton Mifflin in 1924. This edition was published by G.P. Putnam in 1910. It is very scare and hard to obtain. It is extremely rare in dust jacket. Lippincott books. 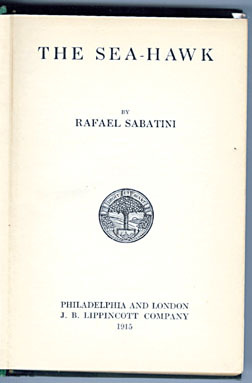 Between 1915 and 1919 Lippincott published first US editions of five Sabatini booksSea Hawk, Banner, The Snare, Historical Nights Series One and Historical Nights Series Two. The Lippincott books were printed in England and released in the US. These books are difficult to find without a dust jacket and are extremely rare with the jacket. Many collectors have assumed that the Houghton Mifflin edition of these five books is the first US edition but the true firsts are the Lippincott books. The Reaping. The Readers Library published this book in England in 1929. It has never been published in the US. 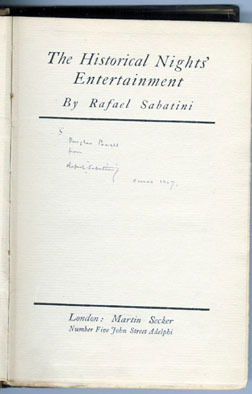 As with many other Sabatini books only published in England, The Reaping is extremely rare and hard to find with a jacket. 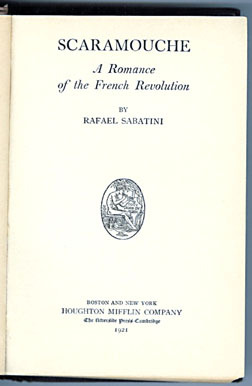 The first edition of The Reapingis small and looks a lot like some of the reprint editions of Sabatini books published in both England and the US. Signed Sabatini Books. Unfortunately Sabatini was not as aggressive at signing his books as Robert B Parker and others are today. Therefore, a signed Sabatini is a very rare item indeed. Even more unlikely to find would be a signed edition published in the US. I suspect Sabatini was not a constant visitor to America even after his star had risen and his books were in strong demand here. Personally, I have The Reaping in jacket, The Suitors of Yvonne and two signed Sabatini books. I would be interested to see how many of the rarities listed here are owned by Sabatini web site visitors. Let us know! Steve's First Editions table is available on this web site. Last updated 29 March 2008. opyright 2002 by Steve Darley. Any concerns or problems about this site, please contact Rimfire.